By assembling a team of super-villains, Red Skull seeks to conquer the world. He has used his wealth to assemble his evil team. He has used a mind control machine to bring them under his power. He now controls their every action. Go at once, Avengers! Try to crush his evil scheme! This arcade beat-em-up had two-player and four-player versions. This is one of the few beat-em-up titles in which the player has the natural ability to use projectiles (press attack + jump simultaneously) and block (hold attack for a few seconds). Though the game is mostly a beat-em-up, a few sections feature horizontal shoot-em-up action. The sky-cycles used by the non-flying characters in those shooter scenes ("Thank you, Wonder Man!") were originally built for Hawkeye. Data East also made a game for the NES with the same title, but it not a port of this game. That NES game is a side-scroller that stars Captain America and Hawkeye. 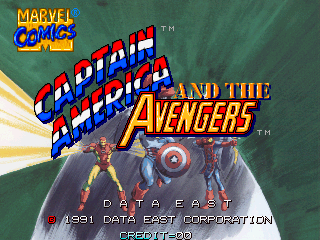 This game references the entire history of Captain America, Iron Man, and the Avengers, but many things were based on then-current events of the late 80's and early 90's. The hero stats and some of the portraits seen in the attract mode demo are taken from a series of character profile books called, "The Official Handbook of the Marvel Universe." 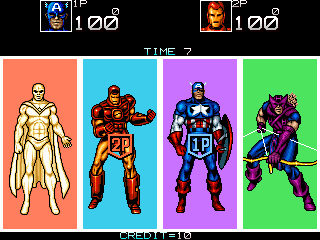 The team had split into The Avengers and The West Coast Avengers (lead by Hawkeye) with Cap being the only adjective-less Avengers Member for most of the time around the game's release. Captain America was also dealing with a freshly-revived Red Skull, who had started wearing a business suit (a late 80's/early 90's trend for both fictional and non-fictional super-villains) and had Crossbones as a bodyguard. Iron Man is wearing the armor that first appeared in issue #231, which takes place right after the Stark War storyline. Issue 242 (1989) of that same series saw the debut of the armor worn in this game by the Mandarin, his arch-nemesis. The Vision had recently been "reborn" into the ghostly-white form seen in the game after a series of events that would need their own page to describe. Many of the villains in this game (Ultron, Whirlwind, Klaw, the Living Laser) were members of two groups that were formed to destroy the Avengers: the Masters of Evil and the Lethal Legion. The "Mech. Taco" enemy is probably based on the Octo-Meks seen in various Sub-Mariner comics. Batroc the Leaper, a Captain America foe, appears in the coin-op's beziel art, but doesn't grace the game itself, which still saddens me to this day. 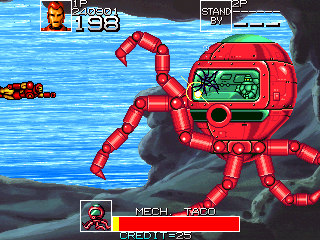 Some gamers wonder why the Juggernaut and a Sentinel robot (which doesn't appear by name) appear in a non-X-Men game, but neither have been exclusive foes of that group. Besides the fact that the Avengers have fought Sentinels in their own comics long before this game, the mutant-hunting robots have sometimes attacked non-mutants for various reasons. Maybe the Sentinel is attacking because it saw Quicksilver handing out power-ups to his fellow Avengers. The Juggernaut needs no explanation as he fights everybody. Speculation Time! Marvel's 1989 "Acts of Vengeance" event seems to have been in the reference material that Marvel sent to Data East. It was a universe-wide crossover in which a cabal of villains organized behind the scenes to attack superheroes that they usually didn't fight with the idea that those heroes wouldn't be prepared to deal with them. It featured a mass break-out of a jail designed to hold super-villains back when that was still a surprising plot point. The Wizard, a Fantastic Four villain who rarely fought the Avengers, shows up in Avengers issue #313 alongside the Mandarin. 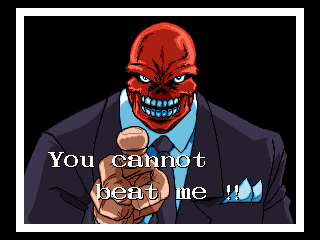 The Controller (called two enemies named Control in this game) was instructed by the Red Skull to use one of his infamous control disks to force Namor to fight Captain America in Cap's series. The Juggernaut was Thor's target during the Acts of Vengeance storyline.